This week, Canada lost a national treasure. Stuart McLean, best known for his radio program The Vinyl Café and early days on CBC radio, passed away at the age of 68. Stuart was one of the best teachers and mentors I ever had. I first met Stuart in 1984 where he was one of the young, hipper instructors in the Ryerson school of journalism. (I’m smiling as I write this because Stuart never in a million years would have considered himself hip.) We were instantly smitten by him. Stuart wasn’t just a teacher. He was a friend. He was one of us. He’d invite us to his home for coffee on the weekends to hear our story ideas, and review transcripts or tape, or go out for a beer after a full day in the studio. As a teacher, he was patient, encouraging and insightful. He’d let us explore and discuss ideas, perched on a desk at the back of the room, always watching and observing and jumping in when needed to steer us in the right direction. He knew the greatest learning was by doing and exploring, and gave us full reign to make mistakes, learn and grow. While many people may remember Stuart as a great storyteller, I will always remember him as a great listener. Stuart had this uncanny ability to make you feel like you were the only person in the room. He gave people his undivided attention and hung on their every word. I remember the time Stuart turned the tables on me and interviewed me for his radio program and one of his books. The segment was on Ernie the Hot Dog Man. Ernie was a fixture on Ryerson campus, and Stuart interviewed some of his students to find out what Ernie meant to us. It was unnerving to be on the receiving end of the microphone and Stuart’s steely gaze. He thrust the microphone under my chin and started asking questions. His eyes never wavered once from my face. He said nothing–just sat and nodded with a slight grin on his face. I realized after I had watched a master at work. Stuart had perfected the art of listening and knew how to get his subjects to open up and share their inner most thoughts and feelings simply by staying silent. 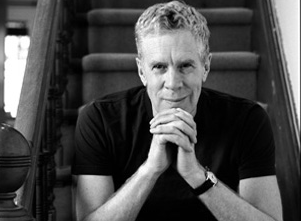 Here are just a few of the things I learned from Stuart McLean. I learned that every person in this world matters and has a story worth telling. I learned to be curious and to ask questions. Most of all, I learned what it meant to be a good human being. I’m still learning from this great man. Stuart, I know you’re up there in the vinyl café in the sky, microphone in hand, capturing new tales. This one’s for you.